Haiti struggles with a notoriously acute housing shortage. In the aftermath of the 2010 earthquake, nearly 300,000 houses were damaged or destroyed, adding to the backlog of nearly 700,000 units already required to meet the housing needs of the country. Since 2010, only roughly 37,000 of these houses have been repaired and less than 20% of them are viewed as long-term or sustainable measures. In a country with 58.5% of the population living on less than $2 per day and where 25% of households lack access to decent housing, the need for affordable housing solutions in Haiti is especially urgent. Patrick Brun is the owner of Chabuma, a local developer who recently finished building the country’s first affordable housing developments in Port au Prince. Chabuma’s Villa Flora and Village La Fontaine developments stand as a model for what is possible in Haiti when affordable housing meets sustainability. Each home offers a safe, clean and green space for families to escape the poverty trap and invest in their future. In a country where land titles are rare and houses are often purchased on the informal market, Chabuma’s developments offer a unique opportunity for low and middle-income households to gain security of tenure. To fund the developments, Mr. Brun received support from Haiti HOME, a USAID funded program implemented by World Council of Credit Unions (WOCCU) in partnership with the Affordable Housing Institute (AHI). Because Haiti suffers from severe environmental degradation, Chabuma and the Haiti HOME team decided that, in addition to being affordable, their new housing projects needed to also be sustainable. Resource-efficient housing projects promise opportunities to realize sustainable development goals, which are an integral component to WOCCU and AHI’s commitment to sustainable solutions. By meeting high standards of energy and water efficiency, Chabuma’s green and affordable homes will lead to long-term savings for households and contribute to Haiti’s sustainable development. To ensure that housing developments meet high environmental standards—and in the absence of any local regulatory standards to follow—Haiti HOME collaborated with International Finance Corporation (IFC) to enable partner developers’ projects to become EDGE certified. In 2018, Chabuma’s Villa Flora and Village La Fontaine developments were awarded EDGE certification by GBCI. Under this partnership, Haiti HOME offers technical assistance on EDGE standards and provides environmental sustainability incentives to developers to cover the incremental costs of achieving the green building benchmark. “Incentives offered by the HOME Program are intended to bring about additionality effects; in other words, our incentives encourage developers to go beyond what would have normally been achieved and generate better outcomes. This is a clear example of how we have been able to mobilize major innovations in building practices in Haiti,” says Claude Clodomir, WOCCU, Director of Haiti HOME. 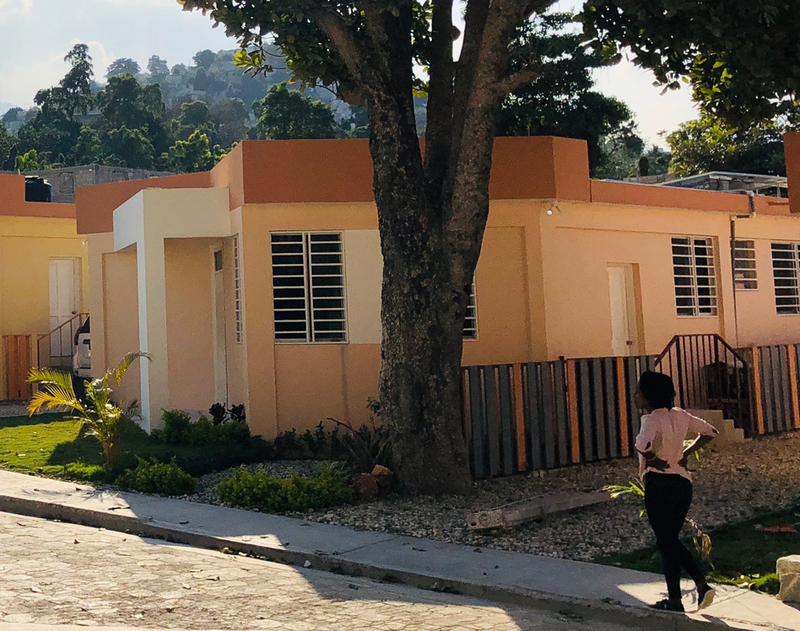 Chabuma’s first project, Villa Flora, is aimed for the Haitian middle class and offers a variety of single-family units and apartments in the heart of Port au Prince. This project achieved a predicted savings of 47% energy, 23% water and 54% embodied energy in materials savings. By including solar panels, low-flow faucets and reflective paint, the development easily exceeded EDGE’s requirements. Residents of Villa Flora appreciate the proximity to the busy city center, while also enjoying the peace and tranquility that the lush grounds have to offer. Because of Port au Prince’s high density and land prices, well-located affordable housing is a rare opportunity. Chabuma’s second project, Village La Fontaine, is aimed at lower-income families and is located on the outskirts of Port au Prince. Mortgages at the development have been financed via a local credit union, enabling households outside of the formal banking sector to buy homes. La Fontaine has achieved a predicted savings of 42% for energy, 49% for water and 45% for embodied energy in materials. Located between large mango trees, the homes at Village La Fontaine cost less than USD $20,000, and utilize solar panels and a rainwater collection system to meet all of the household’s needs. The houses easily met EDGE standards while remaining affordable. La Fontaine is truly unique. For the first time, low-income households have access to safe, green and resilient housing to claim as their own. At Villa Flora and Village La Fontaine, Chabuma has created a new market standard and new developers have since followed suit. The perception that affordable housing in Haiti is too risky has now been shattered. 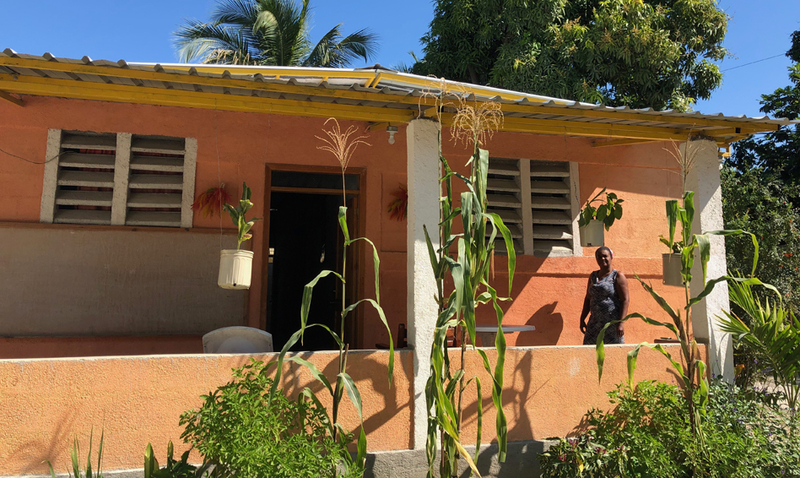 Thanks to EDGE certification, Chabuma and the HOME team were able to achieve what no one else in Haiti could before: prove that housing can be both affordable and green! Olivia Caldwell is a Principal at the Affordable Housing Institute (AHI), where she is currently leading projects across Sub-Saharan Africa, Haiti and the South Pacific. Olivia has a decade of experience in housing finance, housing public-private partnerships, post-disaster reconstruction and sustainable construction.